This is the Method Blend brought to you by Dillanos Coffee Roasters. 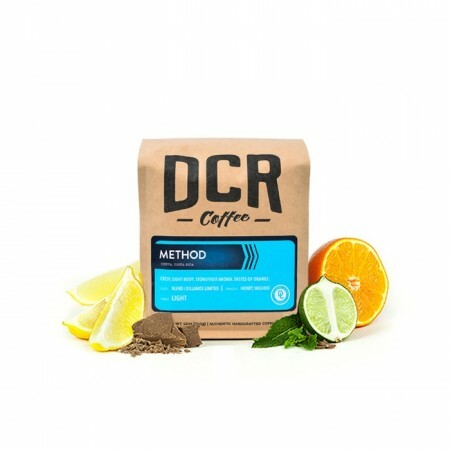 This coffee is a blend of washed and honey processed coffees from Africa and Costa Rica.The result is a cup that is fantastically balanced, with notes of brown sugar, citrus and a floral aroma. Had the floral aroma I loved, yet a boldee taste than usual. Really delicious. Balanced is a perfect description of this coffee. Really great cold brew from this coffee. Absolutely loved it! The citrus flavor was excellent. Very enjoyable. This was okay but not my favorite of the blends I have tried so far. I'm loving this coffee. Nice bold, complex flavor. Great tasting coffee with some nice subtleties, very enjoyable morning brew. I've been using the Aeropress lately and and coffee is tasting much better. More like this please! The citrus notes were great! Would do 3.5 stars if possible. Good coffee, but a little light and bright for our taste. Perfect balance - one of my favorite blends yet. We're behind on our coffee drinking, but ... we LOVE the first batch you sent us. I especially love its smoothness and not too acidic. The flavors are deep and rich. Always happy to have this coffee! We really loved this coffee! It was fresh and flavorful. Only added a splash of cream and it was delicious. Previously have fallen into the trap of adding sugar to my coffee to try to get some extra flavor out of it. Drinking my last cup right now. I was starting to think our drip brew maker (the Ninja) wasn't making decent coffee, but every cup of this was excellent. Really balanced. Subtle citrus with a little brown sugar as the profile says, wish the flavors were more pronounced - guess that's a balanced cup though! **Update - I've been tweaking the grind - Went a bit coarser than normal and wow! Definitely tasting the honey and brown sugar! Loved this one! I really like the honey process on this one. Way over roasted. Tasted burnt. We almost sent it back. It was BARELY salvageable as cold brew. I typically prefer medium roast beans, but this wasnt as bad as I initially thought it was gonna be. You can really get the flavors out if you go over the 15:1 ratio to 500g water and 32g beans. This was my preferred ratio for this bean. Nicely balanced coffee. Its rich, but balanced by great acidity and almost a little sweet nougat on the finish. A touch of earthiness I'm not crazy about, but its subtle. Not terribly complex but enjoyable and bright. Outstanding, smooth flavor and aromatic. Bold taste of Kenyan coffee stands out. Coffee was too light flavored. Like a coffee more bold and richer in flavor., but still smooth. The bag I received was nothing like what I expected from the description and "light roast" designation. The beans I received were definitely borderline dark roast, and I got none of the taste notes that were advertised because of this. This might be a good or even great coffee when properly roasted, but unfortunately this was not my experience. Disappointed, but n=1 and a bag of these beans next week might be right on the money. Overall, the flavor was excellent. However, we could not taste the citrus notes in the coffee. I really am not enjoying this coffee - it tastes burnt. Didn't really taste the "notes of brown sugar and citrus" (potentially due to brew method), but overall a balanced and good-tasting cup! It was good. No bitterness, easy to drink, a bit on the light side for my taste. Not a rich coffee. Good for mornings. I really enjoyed the acidity and light taste of brown sugar. My palate isn't well enough refined to say much more than that I liked this coffee, but it didn't jump out to me as spectacular. I definitely tasted the citrus, especially when I ate it with a clementine, which I liked a lot. A couple of times I've brewed it, I thought it came out tasting a bit "burnt" but that may have been a brewing mistake. Otherwise, I thought it had the right level of body that I typically like, and worked well with a little bit of half-and-half, which I typically use. I'm not sure what I'd like to try next... I really like this one, but would enjoy contrasting some different flavors as well. Thanks! Great flavor! Loved the mellow taste of this coffee. It is good, but it seems like it needs a bit more flavor. Maybe I just need to brew it stronger, but I like the taste. Liked this a lot. Only (minor) complaint is that is was a little light/thin. A little too floral for me. The roast level is perfect. Good flavor, and overall very balanced. A bit rich for my taste, but only barely. Nice solid cup that tasted a bit chocolatey to me. Loved the blend here, really nice coffee. mild and earthy. would like something with perhaps more caffein. Citrus is not usually our favorite, but this was a nice coffee. It was smooth and enjoyable. It didn't seem remarkable, but my last cup I spent all day saying I had a good cup of coffee. The next day, we didn't like it much at all; we seem to have trouble brewing a consistent good cup of coffee with this coffee. So far we've been brewing it with a standard coffee pot and I don't notice the coffee smell in the room like I do some coffees. Some days it seems too watered down and I don't like the aftertaste as much. This has been my least favorite coffee in the subscription so far. I felt like it was too nutty, too earthy, and it reminded me too much of my old Starbucks cup. The description (flavor, character, etc.) provided by Mistobox is spot on. This coffee is fantastic - the best yet. Ordering more now. Not a fan of really acidic coffees although this one did taste really good. Fairly tame. Notes of "citrus and honey" are lost. we are not experts at detecting different notes in coffee, and still working on settings with new coffee maker, but we loved this coffee! This coffee perfectly fits my taste: no acidity, not too dark roasted, tastes good when brewed as turkish. Thanks! Solid tasting coffee. Good balanced cup. Creates a great bloom. A light cup that does so much to easily balance it's aromas and flavors together. At first grind I got a smell of chocolate that seems infused with lemon-lime. The coffee itself sat forward on the note of brown sugar which is well rounded by the citrus acidity. Reminded me of a sour juice that needs sugar to make palatable. Awesome. Its pretty good. It took me a few tries to get the brewing down, but when I did it delivered good flavor. Definitely very balanced. Something a bit stronger would be great. Looking forward to the next bag! Thanks! Good, but I prefer a bit less acid and a bit more nutty. Pretty smooth balanced blend. Not too much stands out about it (which could be a positive). Once it got down to the cooler temperatures I could taste the citrus. But strangely the flavors were only tasted the first few days after arrival. Flavors faded pretty quickly over the two weeks which was disappointing. Hated it! I said I hate Light roast coffee! You still sent me light roast! I want to cancel my subscription! Your site won't let me, how is that legal? I said twice I hate light roast and dark roast, I said I love medium blends. Decent coffee, plenty of flavor depth. A little too acidic for me, but still good nonetheless. We loved this one! our favorite so far. Smell was wonderful when we opened it up and the taste is even better! Too tangy and light- can I please get something else shipped as soon as possible. Not a fan of citrus notes and the acidity that accompanies it. Not very good -tried both cold brew and with my Moka pot. Just bland. I'm not a coffee connoisseur, more like your average coffee drinker one cup a day, two cups on a good day.Having said that, I enjoyed the nice smooth taste of this coffee. Actually taste the citrus taste on each cup that I've enjoyed so far. Good for French press and pourover, interesting blend of two distinct regions. This coffee had good flavor, but I liked some of the sampler coffees better. I didn't enjoy this coffee much. Though I'm not one to waste, I found myself stopping at the local cafe more often than not. I think the citrus flavors didn't sit well with my tastebuds and this brew left an unpleasant aftertaste. Really delicious! Loved the balance of sweet with citrus. Lighter roast than I usually like. Good flavor a bit too fruity for me. I definitely tasted the citrusness of the coffee, which made for a good cup of black coffee. It is a good cup, but it is a bit mild compared to what I'm used to. It is a good change of pace though. I like this, but not as much as some single origins I've had lately, so I think I'd like to stick with single origin from now on. What's the recommended ratio for this particular coffee (using a bee house for pour over)? It's not bad. Good flavor. It's a little light for my tasting. full-bodied and flavorful. A bit tart. Coffee aroma and taste are great, but we would prefer a less citrus-heavy brew. I really enjoyed this coffee blend, the sweet notes came through, it was very smooth, very enjoyable cup in the morning. It also made a very good cup of iced coffee too! Note: This review given is more to my tastes than a hard judgment on the quality of the coffee itself.So I received this as my first shipment and in requesting my range of coffee types, I left it quite open as I'm just wanting to see different types of coffee out there, different roasts, and such to figure out what kinds of beans are to my tastes.When brewing this coffee, I found it to be a little to acidic to my tastes at first. As I continued to consume it, by about the 3rd/4th brew I had come around to it but was not something I would look to revisit right away.Coffee was brewed using a Kalita Wave w/ complementary Kalita kettle.